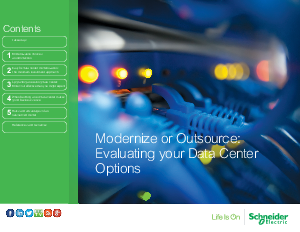 In considering the four principal options of data center modernization, keep in mind that each option need not be treated as a separate and distinct approach. Data center stakeholders may want to combine options in order to better accommodate a particular migration timeline. Or cautious executives may want to simply dabble with the outsourcing option by piloting only a few select applications while still maintaining a core corporate data center. The key critical success factor is the recognition that data center modernization is not a one-time fi x, but rather a critical piece of an ongoing strategy to better service customers.